My first visit to IITA was in 1982. As a young scientist with the Delft Hydraulics Lab in the Netherlands I worked on my first soil science project that also happened to become my last. I had obtained funding for a project on the impact of soil erosion on soil productivity and I was looking for good data. My research led me to IITA soil scientist Rattan Lal who was among the five scientists I had identified across the globe that had the time series data I needed and he agreed to work with me. My funding enabled me to visit all 5 research groups to see their experiments and go over their data. This was my first visit to Nigeria. 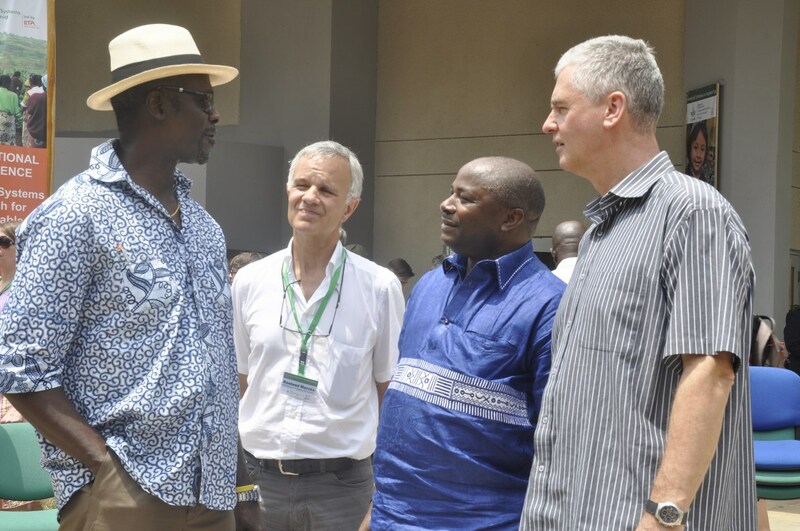 Frank Rijsberman (rightmost) in a huddle with (L-R) Dr Kwesi Attah-Krah, IITA Board Member Roel Merckx, and DG Nteranya Sanginga after the meeting in Ibadan. Staying overnight in Lagos and driving to Ibadan made an indelible impression on me. Lagos was already a bustling megacity and the Lagos-Ibadan Expressway was about getting mad with too many cars, buses and lorries competing for too little space at breakneck speeds. It was the first time ever I saw the burned-out and still burning wrecks of cars and trucks by the side of the road. And then we arrived at IITA. Once cleared by security the car started up the long driveway, flanked by rolling hills with bright green grass, cut smooth like a golf course, dotted with picturesque palm trees, painted bright white. The contrast of this oasis of quiet prettiness with the chaotic world outside the barbed wire fence could not be greater. A well-oiled, well-maintained, well-equipped island of advanced research. A small army of well-trained Nigerian staff to support a team of senior researchers that were almost without exception white, male and Anglophone — or indeed, Dutch. Rattan Lal was a fine host, had many years of excellent data, and was a great collaborator for my project. Since then, I have visited and worked in Nigeria quite a bit, including a two-year stint as Chief Technical Advisor of a UNDP project to strengthen the Ministry of Water Resources in Abuja in the late 80s. But fast forward to 2012: I rejoined the CGIAR as the CEO of the CGIAR Consortium in May 2012 and started an effort to visit all 15 Centers. In July-August the Consortium Board Chair, Carlos Perez del Castillo, and I visited AfricaRice in Cotonou, Benin and then traveled overland to Ibadan. We were received by the new DG, Nteranya Sanginga, and the new Board Chair, Bruce Coulman and given the grand tour. We met with scientists, discussed the newly reformed CGIAR, enjoyed presentations of the key science groups, saw the laboratories, and hiked the forest. The new DG’s enthusiasm was certainly infectious, and it was great to hear of his ambitious plans, but it was also obvious that the institute was a little tired. The infrastructure was aging and the scientists were, too. There were certainly a few young and enthusiastic scientists—in the biosciences group for example—and there were some exciting projects such as the development of aflasafe as a biological control method for aflatoxins, but the labs had that look and feel of many other labs I have seen in Africa. Too much old or broken equipment and too few people behind the benches. Out of nostalgia I asked to see the soils lab, the place where I was hosted 30 years earlier. It was rather sad to see that while it was still active, the place bore clear signs of neglect and chronic under-investment in maintenance and new equipment. There was nothing sad about the people working here, though. On our last night we were invited to a sizzling staff party in which the new DG showed he did not just have big plans but also enjoyed dancing the night away. 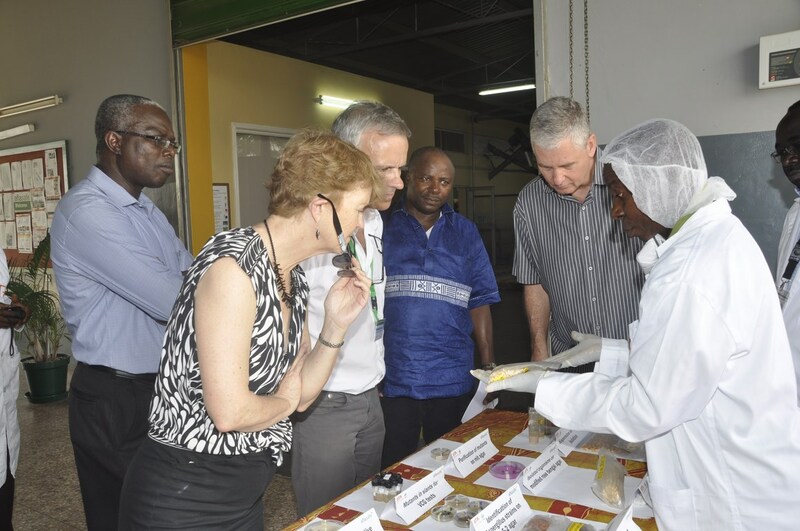 Frank (keft) and Ann Tutwiler, DG of Bioversity International, look at aflasafe samples–IITA’s biological control product for aflatoxin management in maize and groundnut. Early March 2015, I had the chance to visit IIITA again, as a participant in the International Conference on Integrated Systems Research organized jointly by the three CGIAR farming systems research programs. 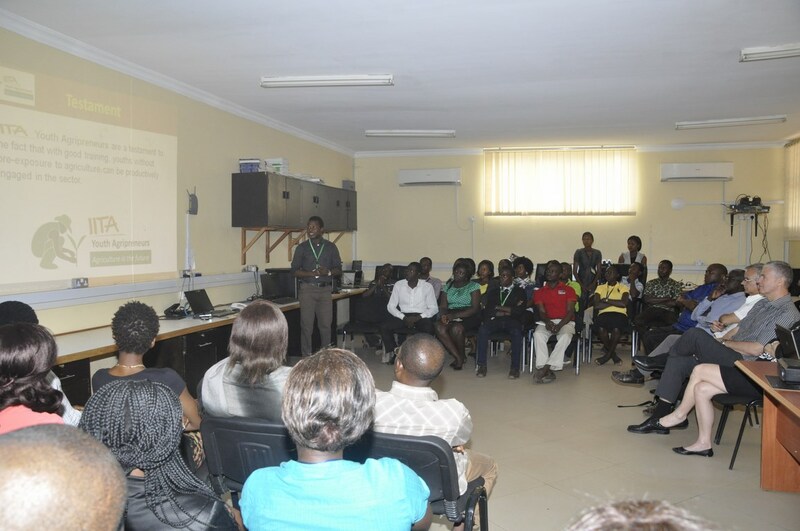 The event was the first big international conference organized at IITA after the Ebola Outbreak in 2014 and brought together over a hundred scientists to discuss and agree on a vision, mission, conceptual framework, and value proposition for systems research in the CGIAR. Not an easy task, but an important one if we are serious about sustainable intensification in smallholder agriculture. For me it was also a chance to see the new IITA. The differences are striking from the moment you drive up that driveway. The first thing you see is the new plant that can produce 5 tons of aflasafe per hour. The rolling hills are still around, but in the dry season the grass looks more naturally savanna-like and brown; the white paint on the palm trees has all but faded away, instead the pink, lilac, and yellow colors of the now flourishing African trees are dominating the colors of the campus. Next thing I noticed: the dorms that house junior staff and visitors were newly painted—a first sign of the overall spring cleaning that has occurred at the institute. The impact of the doubling of senior researchers and the close to tripling of the budget is visible everywhere. Many more young scientists were hired — in fact my tour of the Biosciences lab handed me from one young female African scientist to another. 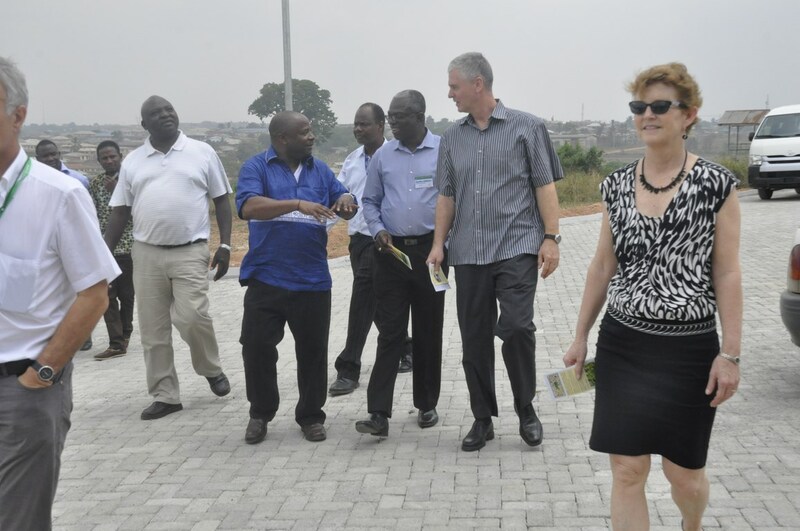 DG Sanginga (second from left) tours the BIP with Frank (second from right) and other guests. Our tour of the newly constructed Business Incubation Platform led to the aflasafe plant where the manager Lawrence Kaptoge showed us the letter he had just received from the Kenyan Irrigation Board requesting for 8.1 tons of aflasafe, being produced the days of my visit and to be airlifted shortly, with another 22 tons to follow. IITA’s aflasafe research has developed effective products for some 13 African countries now, and is showing the production is viable at small to large scales. This work is on the verge of scaling up and out to millions of farmers, if it can now be successfully commercialized with private sector partners. The aflasafe success has the potential for a massive impact on food safety and public health in Africa, as well as on re-opening export markets for products such as groundnut. Dare, an Agripreneur, explains the activities of the IITA youth in agribusiness to the visitors as other colleagues look on. this program aims to show that there is a future for young Africans in agriculture, that there is viable employment and an attractive career in catfish aquaculture, in soymilk production, yam sucker farms and cassava bread production. Dr Sanginga, who is the father of this program and naturally very proud of its success, predicts that it can scale up and out, in Nigeria and other African countries —his vision is about a movement to give a future back to millions of African youth through agriculture and the value chains in the agri-food business. The program is just a start and has already attracted attention from IFAD, AfDB, and the Nigerian government. It is a good example of what the CGIAR can do when it focuses on youth—very timely with “gender and youth” identified as a key cross-cutting issue in the new CGIAR strategy. At the BIP, the visitors listen to a researcher explain about the production of aflasafe and Nodumax. Finally I met with the newly expanded NRM group led by Bernard Vanlauwe. The focus here is on helping restore the fertility of 7 million hectares of degraded lands, as per IITA’s 10-year strategy. Products like NoduMax, or a nutrient manager for cassava not unlike IRRI’s nutrient manager for rice, are intended to make this possible, as well as the groups participation in CGIAR Research programs such as the Integrated Systems for the Humid Tropics , Water, Land and Ecosystems, Climate Change, Agriculture and Food Security, Grain Legumes and Roots Tubers and Bananas . Group photo with IITA Youth Agripreneurs. At the end of the visit my hosts asked if I would like to see the soils Lab again… and it was a pleasure to be led around by Joseph Uponi, the same manager who showed me the lab in 2012, this time proudly demonstrating brand-new lab equipment, such as the Infrared Reflectance Spectroscope that can provide high through-put characterization of the chemical composition of soils. IITA’s lab now works closely with Keith Shepherd’s excellent Soil-Plant Spectral Diagnostics Lab at ICRAF, building soil libraries for West-Africa, complementing ICRAF’s work in East and Southern Africa. A real pleasure to see the soils lab back in great shape! It is incredibly encouraging to see a research institute rising to answer the challenge of nourishing Africa so quickly and so dynamically under difficult conditions. Visiting IITA in 2015 leaves me invigorated and energized; optimistic that the CGIAR Research Centers and their partners may have a future that can surpass the successes of the past—contributing to our core goals to overcome hunger, and achieve food and nutrition security in a climate-smart manner that leaves behind a healthy planet. Thanks to Dr Sanginga and his team at IITA for a great visit!